Once again, Bloom Day snuck up on me...blame it on a busy weekend at Hortlandia! It's amazing how much the garden changes in a months time, isn't it...especially in spring, things seem to change every single day. The Mukdenia 'Crimson Fans' that was just starting to bloom last month are in full bloom...not the showiest, I'll grant you...but charming, nonetheless. 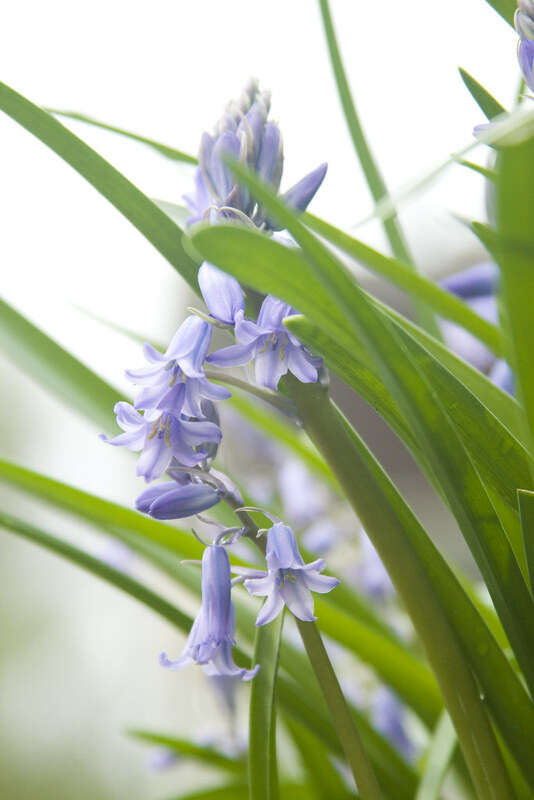 Spanish Bluebells (Hyacinthoides) are pretty much a weed in my garden...still, they are pretty when in bloom. A great garden stalwart, Geranium macrorrhizum, always comes through. I love working around these plants, as they smell wonderful. 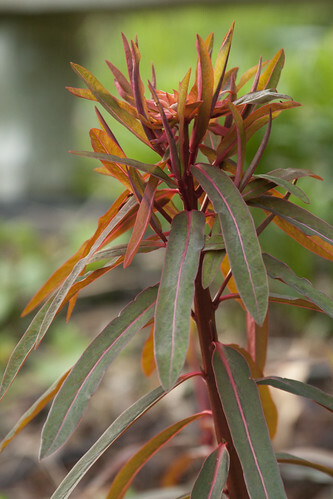 Euphorbia 'Dixter' is about to be gifted to another gardener (one with better luck with Euphorbias). I'm glad it got to bloom one last time in my garden. 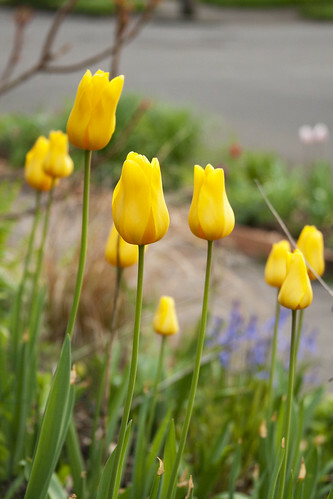 Tulips are pretty much the stars of the April show here in my garden...sadly, they are all random mixes from various box stores...so I have no idea what variety they are. You just can't beat purple and yellow in springtime. These purple Iris are some of the many Iris that I inherited with the house. I've been slowly replacing some of them with different Iris cultivars, both for some variety, and to extend their season. I'll always keep a few of these beauties, though. 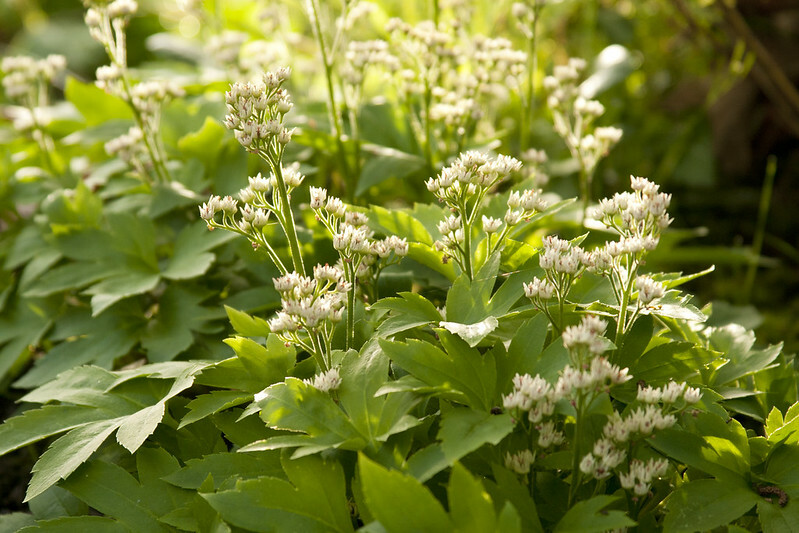 Solomon's Seal (Polygonatum odoratum variegatum) always surprises me by popping out of the sea of Oxalis in the shady north border. Ahhhh, spring time...there's nothing quite like it! It's so great, knowing the whole growing season is just starting...and there is so much yet to come. 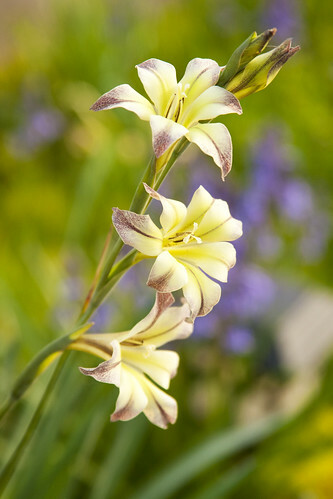 For more blooms from around the world, check out May Dreams Garden...and Happy Bloom Day, everyone! Beautful blooms Scott! 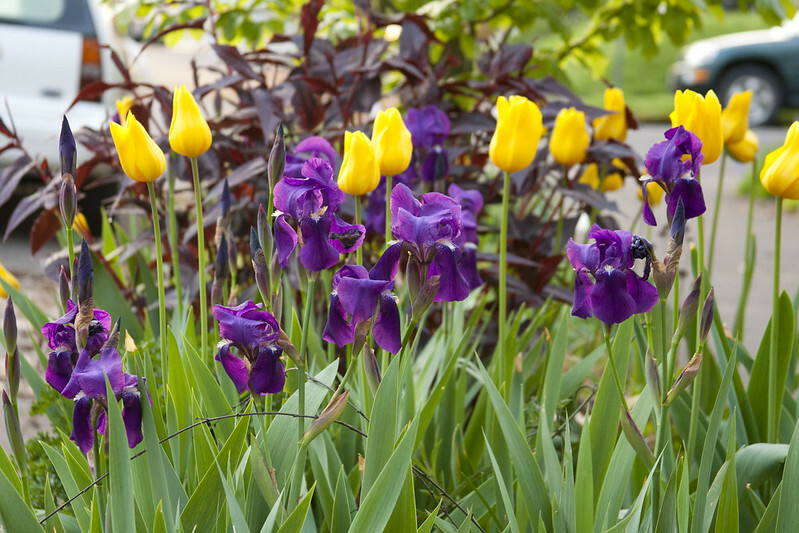 The purple persecaria, iris, and yellow tulip combination is especially spectacular! Happy GBBD! Could you hear me giggle all the way from that part of the world to here? I can't believe how many beautiful flowers you have already - just made my day. I'm still photographing hosta bud-nubs and crawling on my belly trying to find anything that might have sprouted overnight. 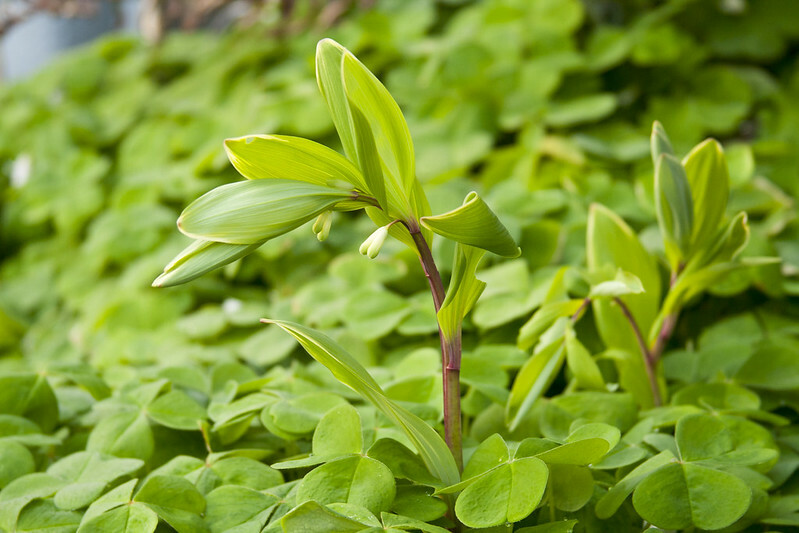 Excellent combo of oxalis and polygonatum - very, very pretty. Wow, they're all beautiful! Spring bloomers make me happy. I'm sure it's because I know summer is near. I don't know if I just forgot or never realized -- you have so many tulips! They're all so pretty. It's always interesting to see how much further ahead Portland is than Seattle. As usual, your photos make your garden sing off the computer screen. Beautiful. So gorgeous Scott! Truly inspirational. Do you find any of your grasses self-seed prolifically (or any of your plants)? I'm going to steal the idea for oxalis at the feet of the Soloman's seal. Your garden is a whole different creature in the spring. A lovely selection of blooms Scott, the colour palette never ceases to amaze. Love the purple iris and yellow tulip combo! Is that a homoglad I see? I can't believe how pretty you can make Spanish bluebells look. You have got so much going on, we are still in limbo. I have some daffodils blooming, but no shrub or tree foliage yet! Your pictures inspire me to become more skillful with my camera. And that tulip/iris combo is a masterpiece. Happy GBBD! 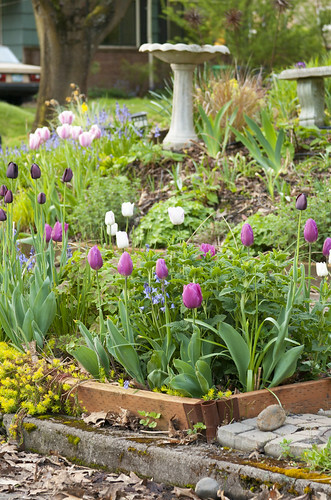 Your interplanting of the tulips and iris is fantastic. Your garden always looks so good, Scott. I love your blossoms. Your Geranium is way ahead of mine. I haven't seen any blossoms yet on mine. And my Mukdenia never did bloom. It just leafed out. Don't you just love this time of year? Your garden is full of small delights, Scott. 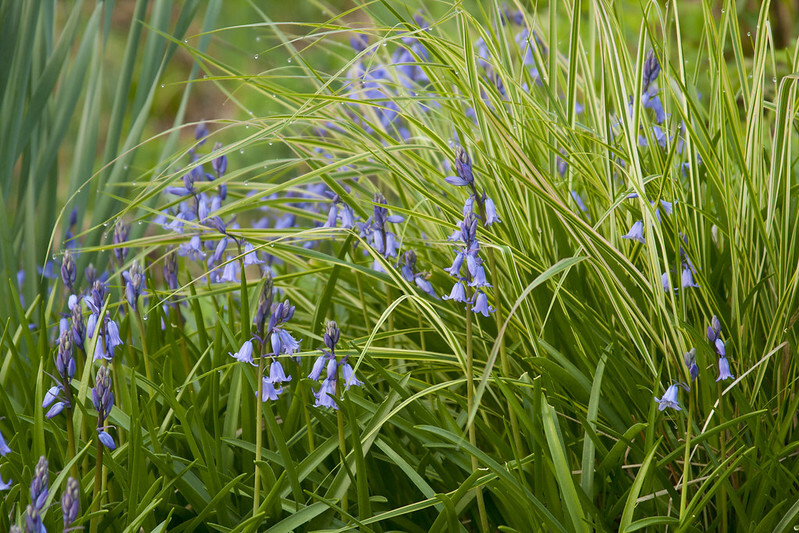 You even make me appreciate the hyacinthoides. Every time I see one of those lovely little ornamental strawberries, I'm completely charmed. Maybe I'm wrong to think they'll run all over like the native fragaria? You are absolutely right about the promise of spring. This year, it seems even more wonderful than ever. 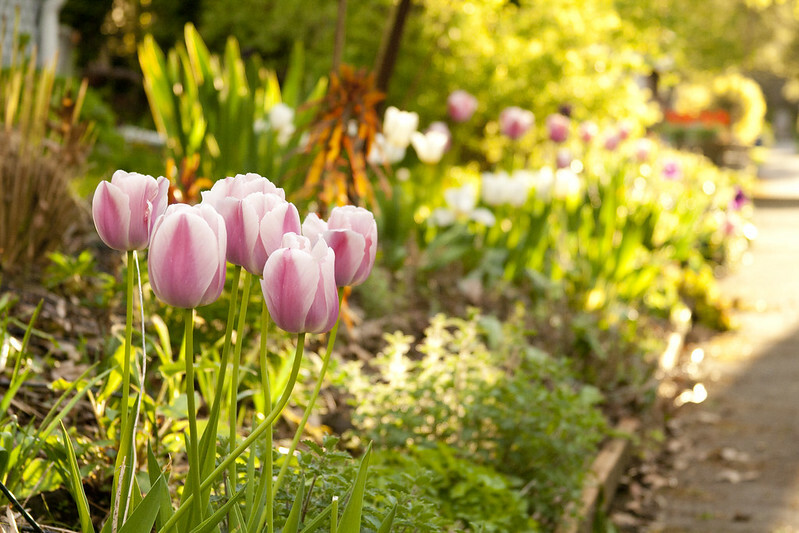 What a beautiful spring garden, the tulips are stunning! 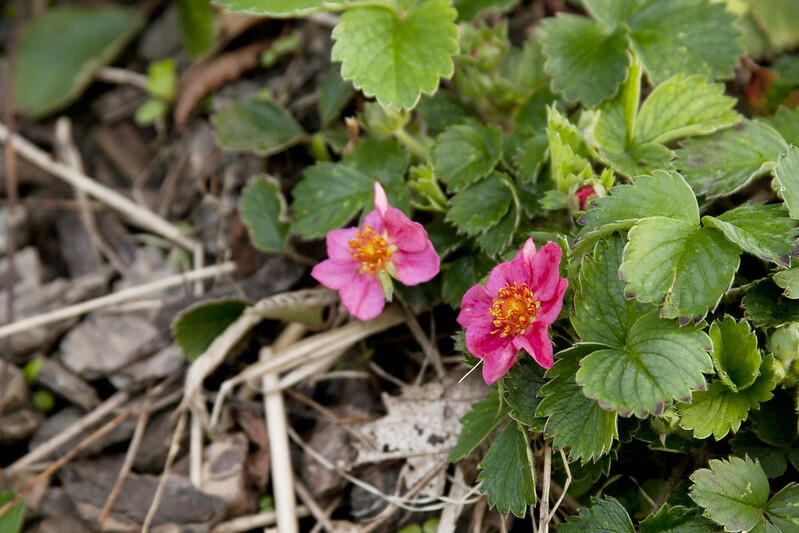 Do you get fruit on your ornamental strawberries? I grow a variety called Pink Temptation which have pink flowers a bit paler than yours, but they have lots of fruit too and it's lovely and sweet! I origninally got them for the flowers but now I don't grow any other kind of strawberry. It's so much warmer where you are, my irises are a long way from blooming, and also my Pink Panda strawberries. Mine have spread a lot but don't have much fruit. I never heard of a Homoglad, is it really fragrant? It seems really early too. Oh what a gorgeous array Scott especially the one you've marked "Homoglad"
Lovely how you've managed to tuck some bulbs in with all your perennials! I've checked out Pink Panda in catalogs a few times, it looks lovely in your photo. Maybe I'll have to add it to my wish list. I love your flowers... and your weeds. When my mom comes to visit I always tell her I have the prettiest weeds! Stunning as always, Scott! OMG, I told you my story about Fragaria 'Pink Panda' haven't I? It's the very first plant I ever mail-ordered thinking that it was this super rare and elusive PINK, OMG, PINK-FLOWERED STRAWBERRY! LOL! Scrolled through the last few posts, Scott, your photos just blow me away. They are incredible. Love your transformation of the parking strip. Super jealous seeing that Tiger Eyes Sumac along the edge of the garden. Hi Scott! 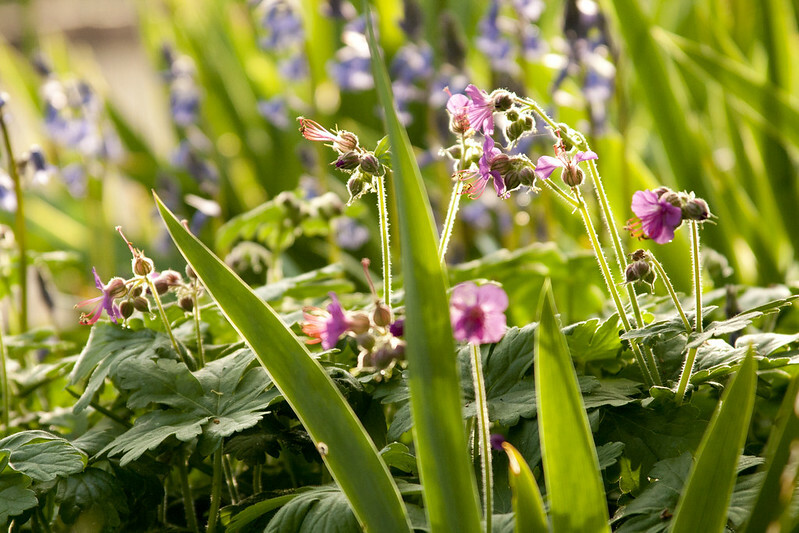 your garden looks great, as usual, and the picture of the bluebell taken from below really impressed me. I like the smell of geranium macrorrhizum too. I hear you - those Spanish bluebells are everywhere and unsolicited, but I don't have the heart to yank them out! Fantastic photos! It's really very difficult in this busy life to listen news on TV, so I simply use internet for that purpose, and get the most up-to-date news. Hi there to every body, it's my first visit of this web site; this webpage includes amazing and really good information for visitors.